Our new season starts on 13th April 2019. We hope you will come along and try something new like learning to play bowls. Visit fixtures and results to find out more! We are a friendly outgoing parks club on Parliament Hill that’s been established since 1937. We have one of the best greens, in one of the most beautiful green spaces in London. We welcome new members of any age and have fully accessible facilities, including a club house and changing rooms. 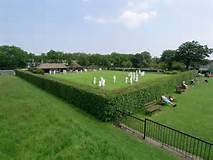 We play roll-up club games on most days from 14.00, whilst also taking part in District and County matches. We have a Level 2 Senior Coach who can provide free lessons to new members. Please feel free to browse our site for more info about us; and if you have any questions or want to know more about our coaching – please see our New Players and Coaching page or use our contact form to get in touch. The Club takes the safety of its members and the public seriously and has full liability insurance; and our coach adheres to strict safeguarding procedures (DBS Assured).